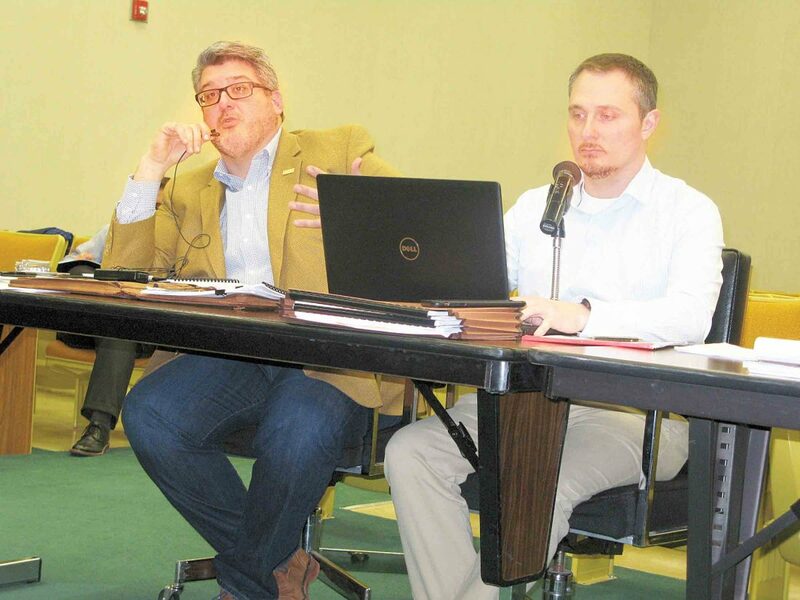 Photo by Evan Bevins Parkersburg City Council Vice President Zach Stanley, left, speaks during a March 13 hearing on the municipal budget as Councilman J.R. Carpenter listened. Stanley served as the presiding officer for the budget hearings. 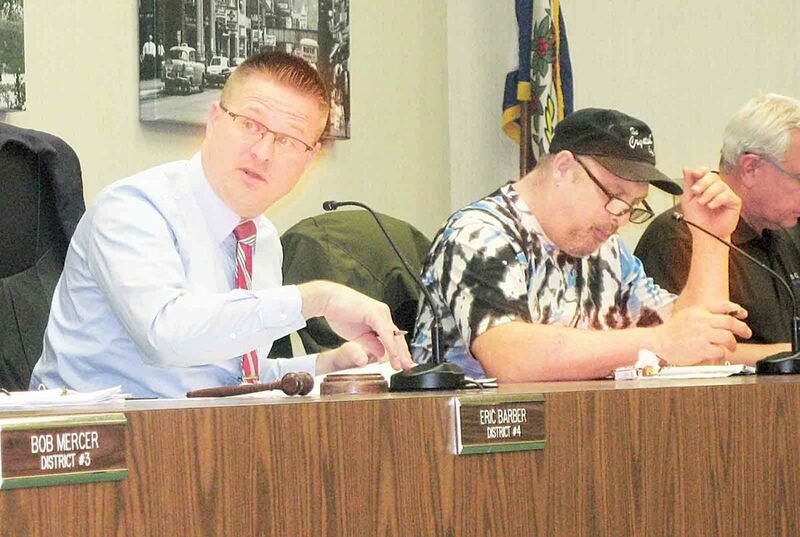 Photo by Evan Bevins Parkersburg Mayor Tom Joyce, left, speaks to members of Parkersburg City Council during the first hearing on the 2019-20 budget on March 7 in council chambers at the Municipal Building. 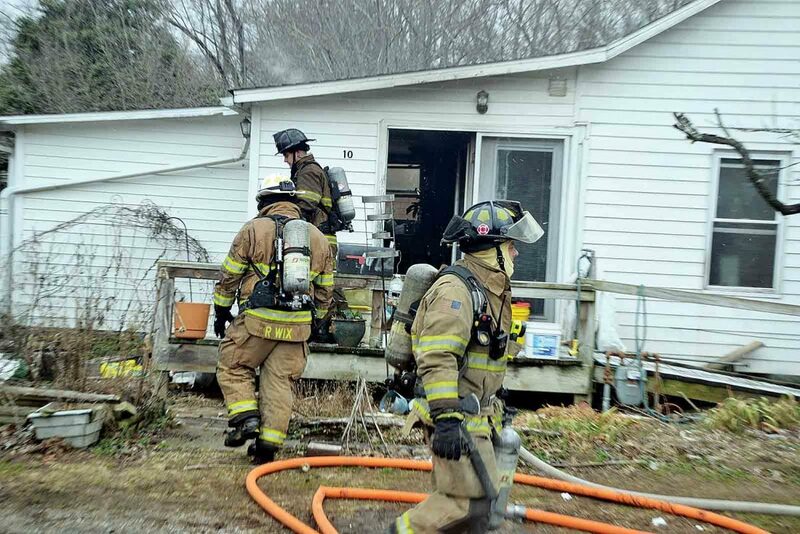 File Photo Parkersburg firefighters are shown on the scene of a Feb. 14 fire on 40th Street. Most firefighters will receive a $1-an-hour raise under the 2019-20 budget recently approve by Parkersburg City Council. In addition, a 5 percent reduction of the fire fee is planned, although it must first be approved in a council ordinance. 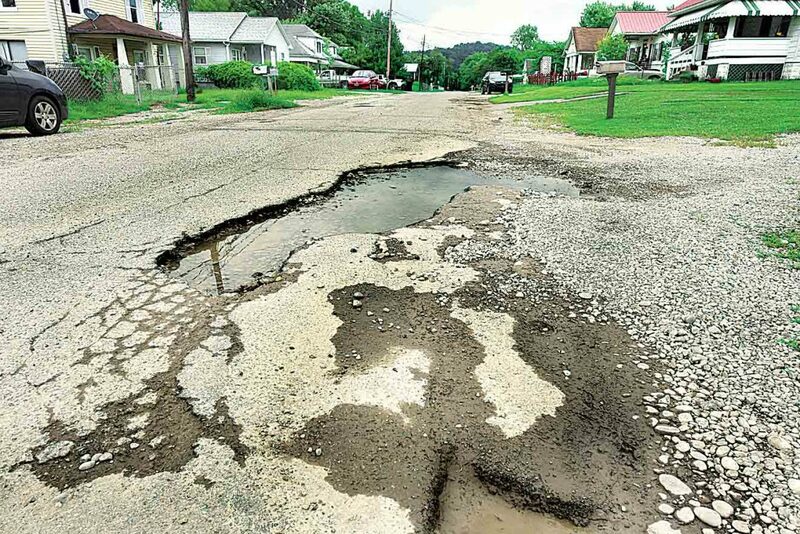 File Photo A damaged section of Elder Street is shown in 2018, prior to Parkersburg’s annual paving project. The recently approved municipal budget includes nearly half a million less for 2020 paving than 2019. 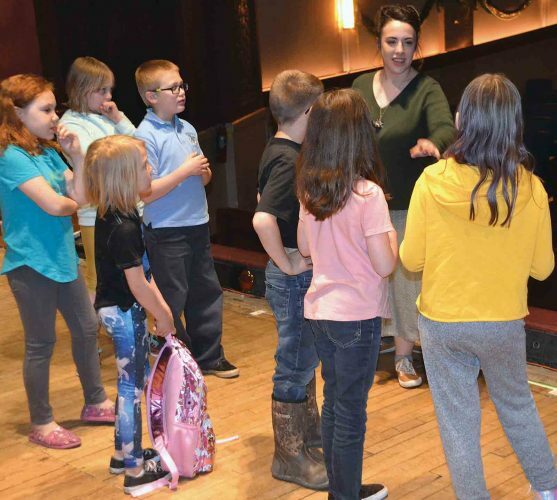 PARKERSBURG — The approximately $34 million 2019-20 budget recently finalized by Parkersburg City Council includes a number of changes from years past and the continuation of recent initiatives. Here’s a look at key parts of the budget, what’s different and why and the adjustments made during the final hearing on Monday. The municipal budget includes $725,332 more in salaries and benefits than the 2018-19 spending plan. Some of these went into effect during the current fiscal year, such as the $2.53-an-hour raise for police officers and reclassifications of several Public Works jobs. Others will start with the new fiscal year on July 1, including a $1-an-hour raise for all firefighters except half a dozen who have not completed three years with the department and attained the rank of firefighter first class. They’ll get an additional 25 cents an hour. The firefighter raises will require a council ordinance, along with pay increases for the municipal court/parking clerks, finance support clerk, public safety communicators and a craftsman in the Parks and Recreation Department. The latter will come through reclassifications, Finance Director Eric Jiles said. Employees who did not receive a raise in the current fiscal year and aren’t otherwise specified for one in the upcoming budget will receive a 3.2 percent pay increase, following the recommendation of a recently completed salary and wage survey and a non-binding resolution passed by council on a 6-3 vote in February. That will not require an ordinance, thanks to new salary tables recently approved by council. The non-binding resolution also recommended no raises for department heads, but Mayor Tom Joyce included them in the budget proposal. He said the city has left those positions out of incremental raises in the past, resulting in larger increases being granted later to keep the positions’ pay competitive. “If council wants to categorically exclude them, I think that would be very shortsighted,” Joyce said during Monday’s hearing. A motion to eliminate the department head salary boosts — including an additional $6,000 a year for the city attorney — failed 7-2. “I cannot and will not support any raises for the directors,” said Councilman J.R. Carpenter, the lone council member to vote against referring and approving the budget. In the fall of 2017, council voted to double the police fee from $4 a month on residential property and $8 for commercial to $8 and $16 a month respectively and hike the fire fee by 95 percent. The moves were made to cover an additional $2 million a year in police and fire pension payments after the city closed the existing plans to new hires. That allowed the city to move to a new funding method which, although initially more expensive, is projected to cause payments to stabilize and eventually decrease, rather than going up 7 percent each year until the liabilities are fully funded. Joyce said the pension changes have made a difference, so he proposed a 5 percent reduction in the fee, which will reduce revenue by an estimated $153,500 a year. Although the revenue adjustment is budgeted, the reduction must still be approved by council through an ordinance. It was barely discussed during the budget hearings, indicating support from council, whose members have repeatedly said they would look at ways to reduce the fees. The user fee is projected to see a $95,000-a-year decrease, primarily as a result of the federal Bureau of Fiscal Service no longer collecting it from employees who work primarily from home outside Parkersburg’s city limits. An adjustment to the way the city accounts for uncollected fees was recommended during the audit of the city’s 2017-18 books, resulting in a reduction of about $155,000 in the general and sanitation funds. It also cut the June 2018 fund balance by $850,000, after the books were closed. An $850,000 allocation from the stabilization fund is included in the upcoming budget to balance that change, Jiles said. While increases of $294,946 in municipal sales tax and $98,561 in business and occupation tax revenue are projected in the budget, pay and benefit increases, revenue decreases and other factors led the administration to recommend an additional $500,000 contribution from the user fee fund to balance the budget and maintain services. As a result, just over $1 million in user fee money was budgeted for street paving and slab replacement. The city budgeted $1.5 million for this year’s paving project and ended up spending more than $2 million last year when bids came in higher than anticipated. With updated valuation numbers, the property tax revenue for 2019-20 increased to the point that the administration recommended allocating an additional $117,442 to paving efforts. Council voted to put that money in the contingency fund instead, with Councilman John Reed saying it could still be applied to paving at a later date. With a splash pad and additional repairs and improvements at the City Park Pool slated to debut this summer, council decided in a series of 6-3 votes to allocate an additional $130,000 to add a slide at the pool. While Joyce and the three council members who voted against it questioned spending even more on an already $2 million-plus project, supporters said it would complete the effort by adding an attraction for older kids. Although council voted 5-4 Monday against the administration’s proposed amendments to increase the revenue projections and allocate those funds, portions of the proposal were approved separately. Council voted 9-0 to allocate $12,540 from contingency to fund the pay for a part-time supervisor to oversee a crew of Parkersburg Correctional Center inmates to mow grass and weeds in city lots and on properties not being maintained by their owners. Joyce said that would be more cost-effective than using a police officer. “Anyone who receives the training from the Corrections Department can be a supervisor,” he said. Joyce had proposed an additional $38,000 for the Street Department’s contractual services line item to fund a suggested program in which the city would pay half the cost of the labor to install or repair a sidewalk in front of commercial property, with the property owner paying for the other half and materials. 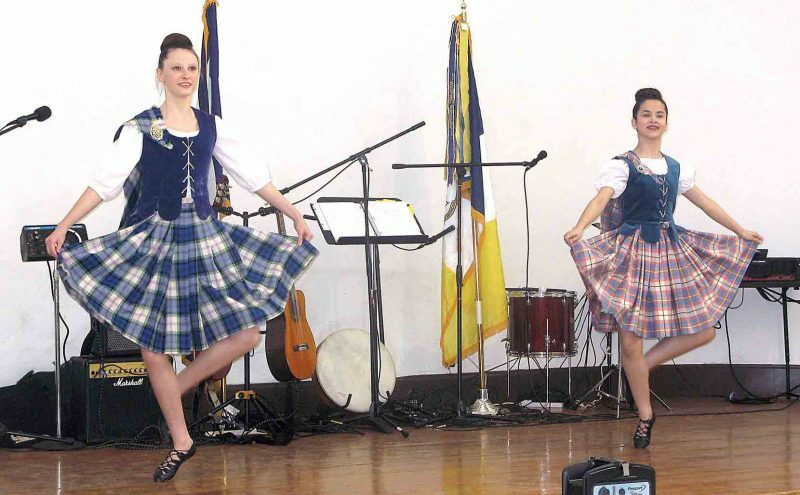 The program was discussed at a January council meeting and referred to the Finance Committee. Committee Chairman Zach Stanley said he’d been waiting on a proposal from the administration before scheduling a meeting to discuss the program. A motion to reallocate $10,000 for an equipment hauler for the Parks and Recreation Department to that sidewalk program passed 7-2. A motion to move the same amount from the Fire Department’s overtime budget to the contractual services line item for Streets failed 6-3. The administration also requested $6,000 to purchase a pair of portable speed control devices, which Joyce said are easier to transport and install than the city’s aging speed trailer. Police Chief Joe Martin said the devices can either inform drivers of their speed or record data at the intersections at which they were placed. Which type the city will purchase has not been determined. A motion to provide that money from the contingency fund passed unanimously. This marks the second consecutive budget in which the city will purchase equipment outright rather than entering lease-purchase agreements. 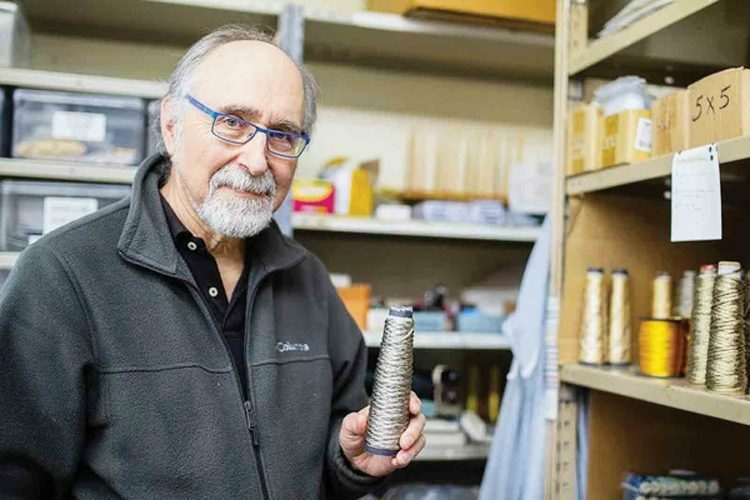 Existing lease/purchases were paid off last year after a change in government accounting rules provided the city a one-time influx of $9.2 million originally set aside to cover the accrued liability of retiree health benefits. Equipment purchases planned for the upcoming fiscal year include $184,000 for four new police cruisers and related equipment, $55,000 for a three-quarter-ton sanitation truck and $25,000 for a trash hauler for the vehicle; $44,000 for two new code inspector vehicles; $35,000 for a used skid-steer for Parks and Recreation; and $10,000 for equipment to rebuild a 1995 backhoe in the Streets Department. Another $100,000 was earmarked toward the future purchase of a Fire Department pumper truck, estimated at half a million dollars. The city’s renewed focus on stormwater management was funded to the tune of $526,000 — $366,000 to maintain existing systems and $160,000 for new ones. 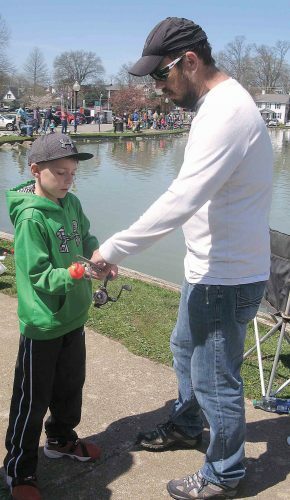 The budget also includes $40,000 for a celebration of the 200th anniversary of Parkersburg’s incorporation next year. Joyce has said various free events will be planned.